Another important day went almost unnoticed. Can you identify this place of great importance to the Nation. Have a glimpse of this majestic building. 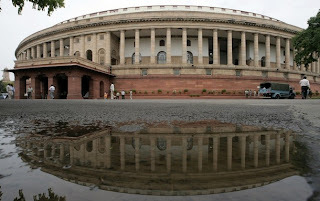 It is not simply a building.The Parliament of India (or Sansad) is the federal and supreme legislative body of India. 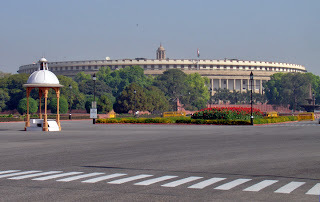 It consists of two houses – the Lok Sabha and the Rajya Sabha. It is located in New Delhi at Sansad Marg. Any bill can become an act only after it is passed by both the houses of the Parliament and assented by the President. The Central Hall of the Parliament is used for combined sittings of the lower and upper houses and is of historical significance. Many of us have only short memories. Eight years back, the whole nation trembled. The attack on India's Parliament stunned a nation that watched what was happening live on television. 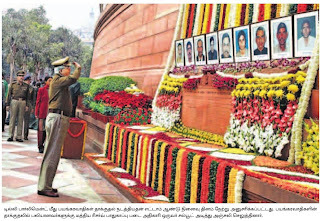 Jus to recall the news, Terrorists on December 13, 2001 attacked the Parliament of India resulting in a 45-minute gun battle in which 9 policemen and a parliament staffer were killed. All the five terrorists were also killed by the security forces and were identified as Pakistani nationals. The attack took place around 11:40 am (IST), minutes after both Houses of Parliament had adjourned for the day. The suspected terrorists dressed in commando fatigues entered Parliament in a car through the VIP gate of the building. Displaying Parliament and Home Ministry security stickers, the vehicle entered the Parliament premises. The terrorists set off massive blasts and have used AK-47 rifles, explosives and grenades for the attack. Senior Ministers and over 200 Members of Parliament were inside the Central Hall of Parliament when the attack took place. Security personnel sealed the entire premises which saved many lives. This is what the Prime Minister said : “The Parliament is the highest representative of democracy and they chose Parliament deliberately as their target. The attack was not on the Parliament but on the entire nation. We will see that the terrorists are unsuccessful in their attempts. We are fighting terrorism for the last two decades and the entire country is together in this crisis. We are with the families of the people who laid down their lives fighting against the terrorist attack on the Parliament. Now , after eight years – how much the Nation remembers and what has been done ??? 1) The Joint Parliamentary Committee took stock of the security arrangement and suggested - Unobtrusive body scanner, latest surveillance system and luggage scanners et al. to be imported from the West to upgrade the security system in Parliament. 3) In 2002 the Delhi High Court convicted seven people and among those convicted were the Delhi University lecturer SAR Geelani, were Jaish-e-Mohammed chief Maulana Masood Azhar, his henchmen Gazi Baba and Imran, Mohammed Afzal, Shaukat Guru and his wife Navjot Sandhu alias Afsan Guru. 5) The Supreme Court had awarded capital punishment to Mohammad Afzal Guru for his involvement in the Parliament attack case. Afzal was sentenced to death on December 18, 2002 by a trial court. This was confirmed by the Delhi High Court and upheld by the Supreme Court in 2004. 6) This hanging was confirmed to on Oct 19 but was put off following a mercy petition filed by his wife. Subsequently, our Former President A P J Abdul Kalam has answered critics over the delay in deciding on the mercy plea of Mohammed Afzal Guru, facing a death sentence for his role in the terror attack on Parliament, contending that he had not received any papers from the government. This is a land of democracy and there are some who feel that hanging would have negative effects on the peace process in Kashmir. An eye for eye is a cruel barbarism though the Nation knows well that well the consequences of pardon. By letting go, the state often allows the criminal to linger in the popular imagination of a people as a hero to inspire far more dangerous acts of terror in future. Indian doctors did their best: Akram""
பார்லிமென்ட் வளாகத்தில் நடந்த தாக்குதலை மறந்து விட்டோம் என்ற எனது பதிப்பு மேலே. 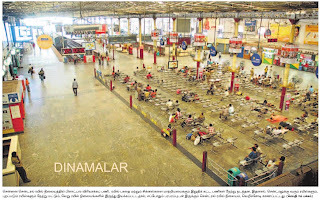 நல்ல பத்திரிகையாக தினமலர் மதுரை பதிப்பில் மட்டும் முதல் பக்கத்திலேயே படத்துடன் செய்தி வந்துள்ளது. ஆனால் சென்னை பதிப்பில் அந்த இடத்தை சென்ட்ரல் பற்றிய செய்தி பிடித்துள்ளது !! It is unfortunate that patriotism of most Indians gets kindled only if they are personally affected or if the country faces an existential threat. For many Indians, patriotism is limited to supporting India in cricket matches. The author has highlighted well, the frustration of patriotic indians who are dismayed by the apathy and short lived memory of public to such cataclysmic events affecting the country's psyche and image.